Margaret Wise Brown's simple, rhythmic text about the cycle of a day on a farm, where a family of animals peacefully plays and sleeps, has charmed generations of children. This big book edition (15 x 17 3/4") is perfect for sharing in classrooms. As in her classic Goodnight Moon, Brown engages children and helps settle them down for sleep as they follow along with the animals from morning to night in the barnyard. In the barnyard there are roosters and cows, horses and goats, and a pink piglet who is learning to squeal. Felicia Bond's atmospheric illustrations add to the tranquil simplicity of this gentle story. 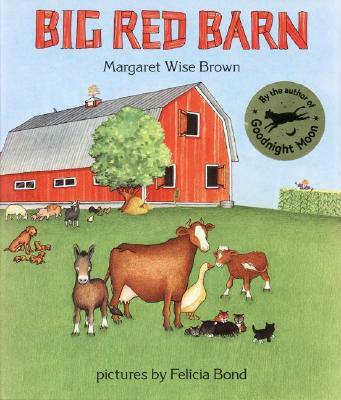 Big Red Barn makes a lovely baby shower gift and is a wonderful addition to any preschooler's library.